This high spec caravan is 6 berth with 2 bedrooms and 2 bathrooms, the master bedroom has large dressing area with an en-suite. The main bathroom has a large shower unit. The caravan is conveniently centrally positioned with views towards Arnside Knott. It has gas central heating, double glazing, microwave, fridge-freezer, Sky is installed as well as direct internet access for wi-fi. It has decking to the front and side which is totally enclosed and secure. The caravan has full skirting around it. The garden incorporates a steel storage shed. Fencing was installed to the side last year. The garden has fencing around it with a secure gate to access the caravan. There are also 2 full gas cylinders. 6 berth caravan with 2 bedrooms. Main bedroom has a king size bed, dressing table, fitted wardrobes and en-suite, the second bedroom has 2 single beds with bedside table and fitted wardrobe. The main bathroom has a double shower unit with heated towel rail and fitted shelves for towels etc. In the kitchen there is a recessed microwave, fridge/ freezer and gas oven and hob, with fitted units and work surfaces around. The caravan has full central heating with a new boiler fitted in 2018. The boiler has a hive style attachment meaning that the heating can be controlled by an app on your phone ensuring that the van is warm and toasty on arrival. There is also double glazing throughout. There is a large decking area at the front of the caravan with plenty of room for a large table, chairs and BBQ, with a border and boat filled with spring and summer flowering bulbs and plants. At the side of the decking is a large area that is suitable for a firepit and further seating area. The garden gets sunshine from early morning until evening and is secure with access via a gate. The caravan is situated in a quiet corner of the site with no passing traffic. Caravan comes with 2 gas cylinders with automatic changeover valve. This caravan is 6 berth, located in a quiet nook of the park, with a great vista into the woods. The master bedroom has an en-suite, dressing table & king size bed. There is a family shower room with a double shower, toilet & wash basin. It has an open plan kitchen/living area, with a twin capacity oven, microwave & fridge. The lounge has a Gas fire & an L-shaped seating area with a pull out bed and storage. The caravan has gas central heating & double glazing throughout. The plot has a private garden with patio, decking & full skirting, and is surrounded by a well maintained hedge. The sale includes 2 full gas bottles. This well maintained caravan is 6 berth with 2 bedrooms. It comes complete with fridge, freezer, microwave and satellite dish. It is positioned in the centre of the site, close to the washroom on a large plot. There is decking down one side of the caravan with a storage/store box, and has a large paved patio area which is a 'sun trap.' The pitch is private, surrounded by hedges and has gated access to both the front and rear. There are 2 storage sheds, a small wooden gazebo seating area, an exterior glass table & four chairs, a double sized bbq with side burner, an outdoor cast iron fire with stone surround and an outdoor cas iron lampost all included in the sale. This is a 6 berth caravan with 2 bedrooms. It is situated at the end of the park very near to White Creek Bay. It has gas central heating and double glazing. All kitchen equipment, crockery, cutlery and glassware is included within the price. There is also a timber garden shed with plastic garden chairs, 2 loungers and gardening equipment. This high spec caravan is 6 berth with 2 bedrooms. The Master bedroom has a king size bed, 2 double wardrobes & ample drawer space. It also includes an en-suite toilet. The second bedroom includes 2 single beds and wardrobe space. There is a separate bathroom with a shower, toilet & sink. The caravan has gas central heating, gas fire, PVC-U double glazing, fridge/freezer & intergrated oven. There are modern wood blinds, curtains & carpets throughout. The plot has a good sized patio and large decking area. Fencing all round with gate access. There is space to park 2 cars inside the gated fenced area. There are also two storage sheds and a galvanised change-over stand with 2 gas cylinders. We have vacant plots immediately available. 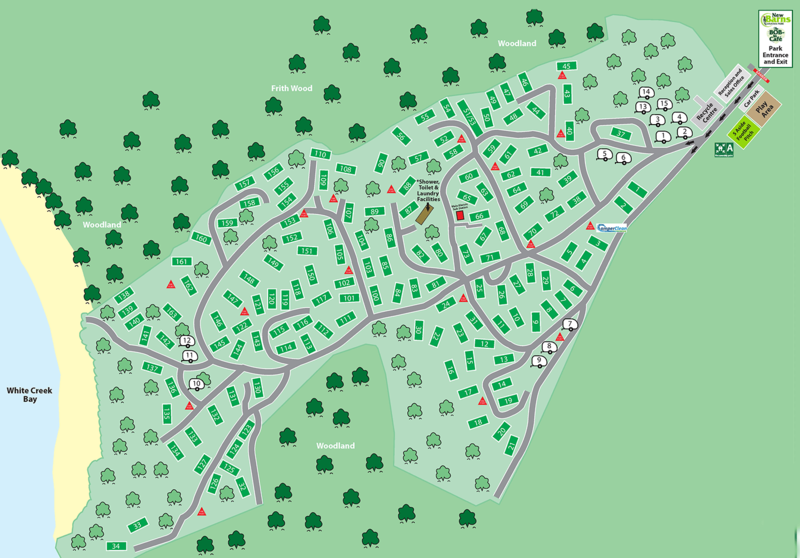 These plots require a new lodge or caravan to be placed on from one of our approved suppliers. We currently don't have any lodges for sale.